Mix together the ingredients for the sauce and set aside. Taste the sauce before adding in the arrowroot. If you prefer it to be less salty, add fresh lime or more rice vinegar to taste. Set a nonstick skillet on medium-high heat. Add tofu cubes and sear for 5 to 7 minutes until the edges are brown. Toss in the veggies and shake the pan around so everything is coated in oil and the veggies begin to sear as well. Cook for an additional 3 to 5 minutes, until the veggies begin to soften, we want them crisp-tender. Reduce the heat and pour in the sauce. The sauce should immediately thicken so shake the pan to coat the ingredients in the sauce. 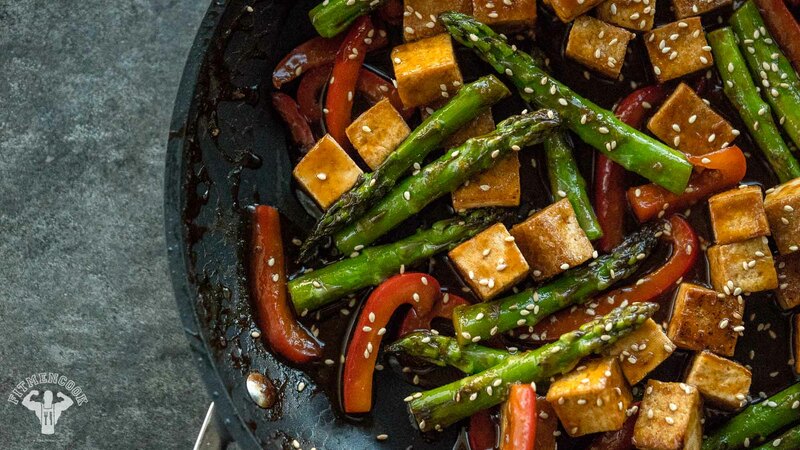 Remove the skillet from the heat and add sesame oil. Shake the skillet to toss and then garnish. Enjoy this with jasmine rice or brown rice. Since it is the fall season, I enjoyed mine with leftover winter squash. AMAZING!